custom Soft Toy Process – an idea or image is all we need to make great custom promotional Plush, retail Soft Toys or limited edition Collectables. Our bespoke Soft Toy fabric, texture, pile & colour can vary considerably, we will recommend the best combination of these to suit your project. Features, such as eyes & nose can be PVC or embroidered. Beans (PVC pellets) can be added to stuffing to give stability or add weight. 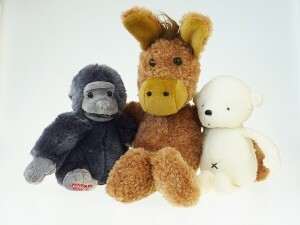 A bespoke Soft Toy adds a tactile warmth & charisma to any corporate character, product, service or campaign. We work from your visuals, sketches or description. A dedicated project manager can advise about style & specification making the absolute most of your character to suit the campaign, purpose or goal. From here a handsample will be provided (this can be tweaked if/as required). Production can be started on approval of handsample, each is carefully made by hand, thoroughly QC checked throughout production then CE tested & carefully packed, ready for dispatch. Approximately 9-13 weeks (handsample 10 days, production 40 days & shipping 35 days or just 7 days airfreight where this is economical). What bespoke Plush, Soft Toy & branding options do you have? Your character, mascot or asset can be produced as a custom made Soft Toy Keyring, Beanie or larger Plush, a bear, animal or any other design.. these can feature branded clothing or accessories of any kind. We include a custom swing tag featuring logo/branding/message or other forms of packaging. What’s the minimum order quantity for bespoke Soft Toys? Generally the minimum viable quantity is 600 items for Plush, 1500 for Beanies, 2000 for Soft Toy Keyrings (however smaller quantities are possible for larger or more complex Plush or where low price is not such an issue). What will a bespoke Soft Toy cost?